In a major admission, the Government of India has officially suggested that none of the 37,754 Madhya Pradesh families living in 192 villages, to be affected by the submergence because of the Narmada Dam in Gujarat, would be given land in lieu of land which they would lose. 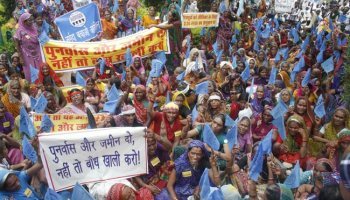 In reply to a letter by Medha Patkar, leader of Narmada Bachao Andolan (NBA) fighting for land rights for tens of thousands of oustees in Gujarat, Maharashtra and Gujarat, the Ministry of Water Resources, Government of India, has indicated that land as a form of compensation is being provided only to Maharashtra and Gujarat oustees. The reply claims, the resettlement and rehabilitation (R&R) package offered to the project affected families (PAFs) is more liberal than the one originally announced by the Narmada Water Disputes Tribunal (NWDT) Award for the Narmada project, worked out more than three decades ago. The reply follows Patkar's letter to Prime Minister Narendra Modi demanding rehabilitation of all Narmada dam oustees in the three states before raising the dam height to 139 metres. The Prime Minister's Office forwarded the letter to the Ministry of Water Resources for reply. The reply says, the Government of Maharashtra was "allotting one hectare (ha) of agricultural land free of cost to each landless oustee, and 2 ha of agricultrual land to major son and unmarried major daugthers to all category of oustees, besides a subsistence allowance of Rs 4,500 per oustee." As for Gujarat government, the reply states, it is "allotting 2 ha of land to landless agricultural labourers, each major sons of all category of oustees with January 1, 1987 as cut-off date, and free core house/financial assistance of Rs 45,000 for construction of core house to the oustee families and their major sons." However, if the reply is any indication, there is no, and would not be any, land-based compensation to the Madhya Pradesh oustees. Thus, the reply says, the Madhya Pradesh government has "increased" the rehabilitation grant from Rs 11,000 to Rs 18,700 for scheduled caste(SC)/schuedled tribe (ST)/landless agricultural labourers/small and marginal farmers, and from Rs 5,500 to Rs 9,350 for other labourers and landless families." It further says, "The liberalization has also been made to purchase the productive assets. Accordingly, the amount to purchase the productive assets has been increased from Rs 29,000 to Rs 49,000 for SC/ST/landless agricultural labouers and from Rs 19,500 to Rs 33,150 for other labourers and landless families." The reply does not mention any possibility of paying land compensation to the Narmada dam oustees. No reason for this has been given. Rejecting the Ministry of Water Resources reply, the NBA has said, the so-called special rehabilitation package of Madhya Pradesh gives cash in lieu of land, promoted by the state government since 2001 and then 2005 "has resulted in a few thousand fake registries." land ready to return the cash." The Jha Commission report, which is said to have endorsed large-scale corruption in rehabilitating oustees, has not been made public. NBA underscores, "This has left thousands of families in Madhya Pradesh deprived of the same", and yet the Ministry of Water Resources reply has "no discussion of the same", adding, "Not more than 50 PAFs in Madhya Pradesh are allotted land in the state." Even those who petitioned to courts for demanding land have not been provided with house plots in R&R sites "near their allotted agricultural land", NBA says, adding, "There are hundreds who are allotted house plots near the original village while land is 150 to 200 kms away! All of them continue to struggle, staying put in the original villages." Critiquing even the "liberal R&R policy", NBA says, "What is not pointed out is that in Maharashtra as well as in the hilly communities of Gujarat and Madhya Pradesh, almost 100 per cent of PAFs are adivasis -- many of whom have been categorized as landless only since they don't have record of rights but hold and cultivate land." The Ministry of Water Resources claims that of the total 45,496 PAFs to be rehabilitated, all but 310 are left out -- none in Madhya Pradesh, just eight in Gujarat and 302 in Maharashtra. Madhya Pradesh's 1,250 oustees, it adds, have het to be paid the second instalment the special rehabilitation package. The oustees already "resettled" are -- 37,754 in Madhya Pradesh, 4764 in Gujarat and 3878 Maharashtra.